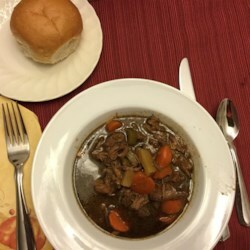 I love this stew; it is wonderful for frozen snowy days. When I make it I omit the bay leaves and cloves, and add a cup of chopped mushrooms, a leak, a can of garbanzo beans and a can of kidney beans, I also add the leftover flour from dredging to thicken the stew. My family loves it, and we have found that it tastes even better the next day, as leftovers.